Yet, at that time, more than four years ago, Switzerland and Serbia could not have imagined that under their tandem chairmanship, the OSCE would play a central role in the biggest geopolitical crisis in Europe since 1990. In the Ukraine Crisis, the OSCE suddenly played a leading role after having almost lapsed into irrelevance in the years before. Under Swiss leadership, the OSCE in 2014 succeeded in sending an OSCE Special Monitoring Mission (SMM) to Ukraine. In addition, Swiss diplomat Heidi Tagliavini negotiated as an OSCE special representative a (fragile) ceasefire agreement in the war in Eastern Ukraine (Minsk I and II). For Swiss foreign policy, the OSCE chairmanship marked a remarkable success story that was also praised abroad without exception. In January 2015, Serbia took the helm of the OSCE. Its chairmanship meanwhile had become rather delicate politically due to Serbia’s position in the “border lands” between Russia and the EU in the shadow of the Ukraine Crisis. In 2014, Belgrade had refused to join Western sanctions against Russia. Due to historical Slavic ties with Russia, many in the West feared that Serbia’s chairmanship would advance Russian interests. In addition, Serbia’s OSCE task force was considerably smaller than the Swiss OSCE task force, and Serbia generally invested fewer resources into the OSCE presidency than the Swiss. During the past 12 months, Serbia deliberately decided against taking courageous political steps, but rather concentrated on maintaining the status quo of OSCE activities that the Swiss had introduced in 2014. In Switzerland’s shadow, Serbia continued the OSCE’s bridge-building and dialogue facilitating role in the Ukraine Crisis established by the Swiss the year before. Belgrade closely synchronized its OSCE chairmanship activities with its 2015 troika partners, Switzerland and Germany, sheepishly following the advice and policy recommendations of both Berne and Berlin. In retrospect, this timid, passive approach still signified a double success, both for the OSCE and for Belgrade. On the one hand, the OSCE benefited from Serbia’s successful stabilization of the OSCE’s crisis management with the adoption of the Minsk II agreement and the continued work of both the SMM on the ground and the Trilateral Contact Group facilitating political dialogue between Kyiv, Moscow, and Eastern Ukrainian separatists. In addition, Serbia was able to integrate the budget of the SMM into the OSCE’s 2016 Unified Budget. On the other hand, Serbia’s active neutrality policy between Russia and the West was strengthened by Serbia’s responsible leadership during the OSCE chairmanship. Serbia wishes to become an EU member, but would like to remain militarily neutral. As agreed, Switzerland maintained responsibility for the OSCE in 2015, for example by providing OSCE special representatives for the Western Balkans (Gerard Stoudmann), the Southern Caucasus (Angelo Gnädinger), and – at least until June 2015 – Ukraine (Heidi Tagliavini). Swiss Foreign Minister Didier Burkhalter remained an active and engaged member of the Swiss-Serbian-German leadership troika of the OSCE. The two important “Ischinger reports” on the lessons of the Ukraine Crisis for the OSCE and on the implications of the Ukraine Crisis for European Security resulted from an idea of Burkhalter and were realized under the troika framework. Of course, the OSCE absorbed Burkhalter much less in 2015 than in 2014. For Switzerland, the management of the Ukraine Crisis was downgraded from the level of the foreign minister to the level of weekly meetings among the troika OSCE ambassadors of Switzerland, Serbia, and Germany in Vienna. After Heidi Tagliavini ended her mandate for the OSCE, Swiss diplomacy lost an important information channel to the area of conflict. If the Basel OSCE Ministerial Council meeting was dominated by acute crisis management and deep communication troubles with Russia, this year’s Ministerial Council in Belgrade was characterized by a certain return to normality. Participants testify that during a restricted, informal lunch meeting of OSCE foreign ministers only (without their advisers) to discuss the results of the Ischinger panel, honest and constructive discussion on the current state of European security was possible – even if predictable propaganda dominated the formal plenary speeches. 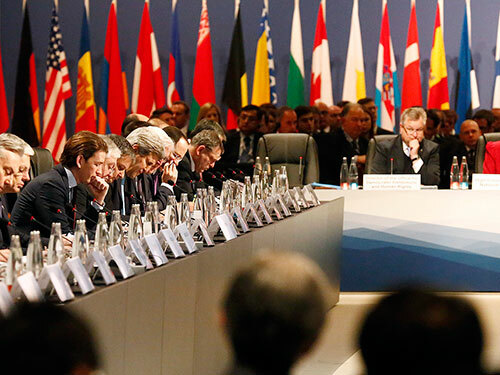 A declaration on Ukraine could not be agreed upon. Thus, the outcome of “MC15” was actually rather meager. In the human dimension, all 12 suggested decisions failed to reach consensus due to obstructionism by a few OSCE participating states. Throughout 2015, Serbia had cleverly tried to find a role for the OSCE to play in dealing with Europe’s two most pressing international challenges, namely the refugee crisis and jihadi terrorism. However, a decision on “migration” could not be adopted in Belgrade. The only substantial decisions adopted dealt with transnational threats (terrorist radicalization and illicit drug trade). Despite the rather disappointing outcome of the Belgrade Ministerial, the OSCE is still back in business. The organization continues to play a central role in deescalating the Ukraine Crisis and reestablishing a strategic dialogue with Russia. Thanks to its comprehensive approach, the OSCE also promises the best sustainable solutions to such acute transnational challenges as violent extremism and migration. In 2016, the German Chairmanship is well-positioned to continue the efforts of the Swiss and Serbian chairmanships and to maintain the usefulness of the OSCE in today’s weakened European security system. Christian Nünlist is a Senior Researcher and Head of the Think Tank Team “Switzerland and Euro-Atlantic Security at the Center for Security Studies (CSS) at ETH Zürich. He is the co-editor of the monthly policy brief “CSS Analyses in Security Policy” and the yearbook “Bulletin zur schweizerischen Sicherheitspolitik“. He is, among others, the co-editor of “Perspectives on the Role of the OSCE in the Ukraine Crisis” (2014), and author of “Summing up Switzerland 2014 Chairmanship of the OSCE” (2014) and “The Performance of the OSCE Ukraine Mission: A View from Switzerland” (2015). This blog entry is an updated and translated version of the op-ed “Im Windschatten der Schweiz”, published in the Swiss daily “Aargauer Zeitung” on 4 December 2015. I think that Serbia’s delicate balancing actually provided a much needed stable ground to bring all OSCE members back to the table. Choosing not to go into expected directions where certain members feel demonized, really brought members back to giving the OSCE a chance to work again. It’s the reset that it needed. Bravo on Serbia and Switzerland.